This is my absolute FAVORITE cheeseball. This is the recipe that got me hooked on cheeseballs. Not the store bought kind that I am not even sure what they are made out of, but the good homemade kind. This recipe comes from my beautiful boss, Diana. She makes it for us every once-in-a-while for special occasions. I made it for New Year's Eve and it was a huge hit. With "The Big Game" coming up, everyone needs some good appetizers to serve, this one is perfect. Combine all ingredients (except almonds and crackers) and stir together until well blended. Cover and refrigerate for several hours or overnight. Pour sliced almonds onto a plate. 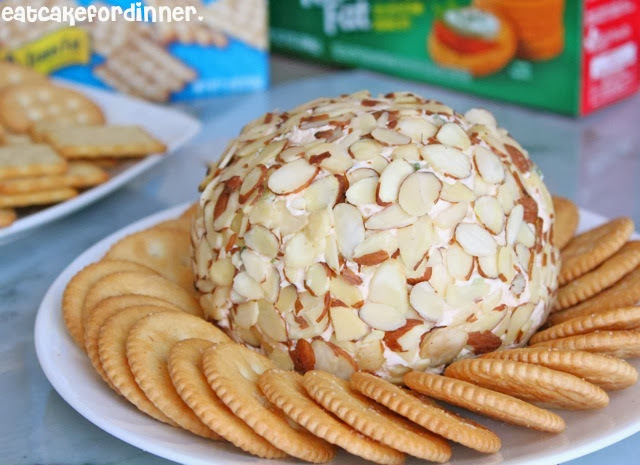 Remove cheeseball from fridge and form into a ball and roll in sliced almonds. 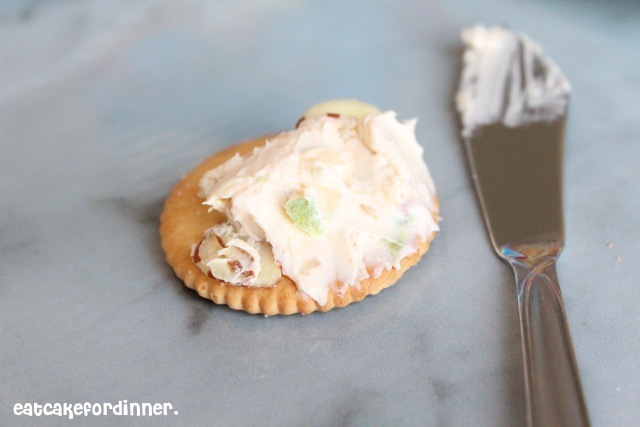 Serve with desired crackers. Jenn's Notes: After I mix everything together, I leave on the counter for 20 minutes and stir several times to ensure the dried onions get fully hydrated and don't end up crunchy. Then, I refrigerate until firm and easy to roll into a ball. I've never made a cheese ball myself. But this picture got me hooked and I will be definitely making it for the next dinner party. I will be trying this for the Super Bowl ! 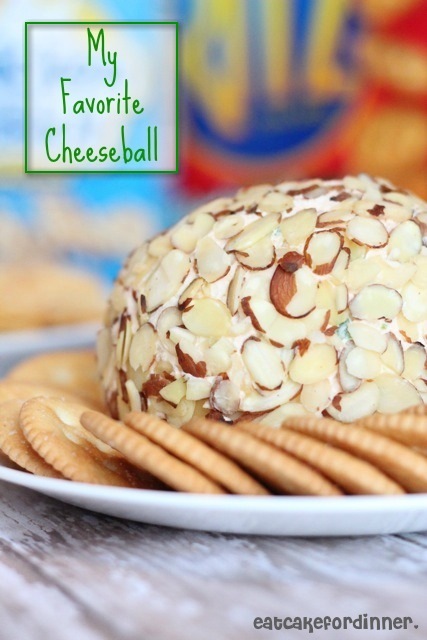 My kids love cheese balls--when they visit there better be one in the fridge! This looks like a great recipe, can't wait to try it. I have our favorite one on my blog. But I'm always open to a new taste tested recipe. Thanks. 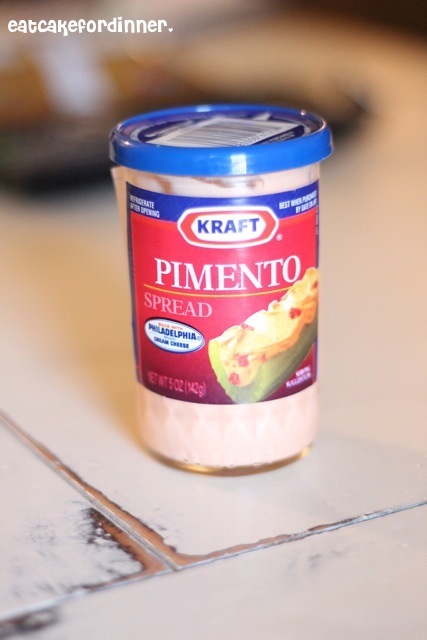 I love that pimento cheese, definately making this cheese ball. I find it really funny how it's titled "My Favorite Cheeseball" because my grandmother gave me an album of all her recipes, including "My Favorite Cheeseball." I don't think the recipe was like yours though! Love it! I haven't seen a cheeseball recipe that used that jar of pimiento spread. Great idea!